When Cinnamon opened for service two years ago, it was capable of grabbing my attention immediately. However, for one reason or another I never stepped in, until last month. The name itself is enough to alert all your senses for good food. And it serves nothing less than that. Moreover, the place has a fabulous ambience, inside and out. When I say ‘out’, I mean it. It is the hidden side of the restaurant at the back with a small garden, which many may not be aware of. The interior is done in dusky orange, copper brown and a golden yellow; Cinnamon being the entire theme. Just like cinnamon, the restaurant gives a sweet and savoury feel. It is warm and welcoming. The lounge is spacious and yet gives a cozy comfort feel, many wish for. It is superb to catch-up with your pals and rock to some live music. But the best part of being in Cinnamon is the food. There is nothing better than a plate full of hot, delicious, aromatic food to dig in to. We had the kitchen’s special, Pork chops and Buffalo Chicken Wings. The generous pork chops were tossed in spicy barbecue sauce and served with a big dollop of mashed potato and buttered vegetables. The meat was tender, juicy and the sauce over it made it picture perfect. The mashed potato was pretty good. It wasn’t buttery smooth but had even seasoning. The Buffalo Chicken Wings are fried chicken wings tossed with fried garlic, hot sauce and rice wine vinegar. The serving of wings was a humble amount, crackling on the outside but soft and juicy on the inside. Here, the sauce is undoubtedly the hero of the dish. For drinks, we were served a mocktail named Pussyfoot. It is a lady’s drink, meant to be real smooth, refreshing and ofcourse lady-like. Well, it wasn’t the best drink I ever had, there was nothing really exceptional about it. Dessert was definitely my favourite part of the entire meal. The Banana Split looked beautiful and it was worth the price. Overall, it was a satisfying experience. 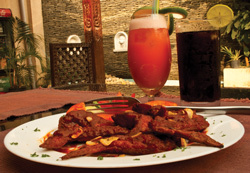 When there is music in the air, a cool drink to sip on and delicious food, what more can one ask for, for less than Rs.1000? 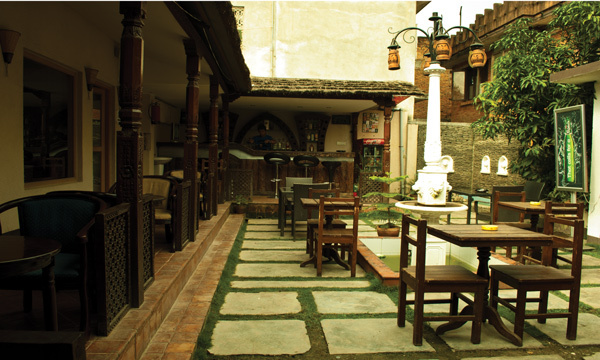 It is one of the coolest hangouts in Patan and you wouldn’t want to miss it.